Edited by Christopher Gerrard and Alejandra Gutierrez. The Middle Ages are all around us in Britain. The Tower of London and the castles of Scotland and Wales are mainstays of cultural tourism and an inspiring cross-section of later medieval finds can now be seen on display in museums across England, Scotland, and Wales. Medieval institutions from Parliament and monarchy to universities are familiar to us and we come into contact with the later Middle Ages every day when we drive through a village or town, look up at the castle on the hill, visit a local church or wonder about the earthworks in the fields we see from the window of a train. 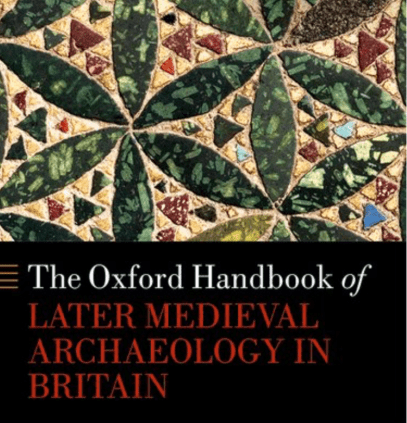 The Oxford Handbook of Later Medieval Archaeology in Britain provides an overview of the archaeology of the later Middle Ages in Britain between AD 1066 and 1550. 61 entries, divided into 10 thematic sections, cover topics ranging from later medieval objects, human remains, archaeological science, standing buildings, and sites such as castles and monasteries, to the well-preserved relict landscapes which still survive. This is a rich and exciting period of the past and most of what we have learnt about the material culture of our medieval past has been discovered in the past two generations. This volume provides comprehensive coverage of the latest research and describes the major projects and concepts that are changing our understanding of our medieval heritage. Emma penned the chapter ‘The Medieval Senses’. Published by Oxford University Press, 2018.